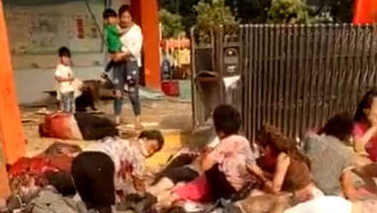 According to CCTV, at least seven people were killed and 66 were injured, including children, in a blast near a kindergarten in eastern China today. Two people died at the scene and five died at the hospital while Nine others are in serious condition. No children or teachers are among the dead. The blast occurred in front of the gate of the Chuangxin Kindergarten at about 4:50 p.m.
'the police and related departments rushed to the scene as soon as it was reported and conducted rescue and investigation work on the site. Currently, the investigation work is still underway." 0 Response to "7 people killed and 66 injured in an explosion near a kindergarten in China"